Analysis: Would Hillary Clinton Have Made a Better President Than Barack Obama? It's an interesting question, but we of course don't know the answer. The fact that some Democrats are asking themselves the question is indicative of how low Barack Obama has sunk in their estimation. Speculation at this point can only make things worse. On many of the things that bother the base, they appear to be teammates. I was one of those who voted for Hilary Clinton in the primary. Not because I didn't like Obama, but because I felt he didn't have the experience and leadership skills to be an effective president. Unlike many who were terrified that voting for Hilary was getting Bill for a third term, I have always believed her to be a strong woman who is able to do quite well on her own. She would never have allowed him to rule in her decision making process. Most assurdly she would have used his knowledge and political acumen to her advantage, but she would have been the Commander In Chief. I am so disgusted with Obama, I keep my fingers that someone will serve him a primary challenge. I agree with Tom, but upon reflection I think a certain sense of idealism made the outcome we got happen. I voted for Hillary in the primary but I refuse to play the "what if" game. So, Ellen, are you saying Hilary, or her supporter, lacked ideals? ;-) Surely not her supporters. I'm confused. Really, it probably wouldn't have made much difference in the long run. They're both corporatists, and anybody who didn't see that going into the last presidential election was naive, regardless of their level of "idealism." Kucinich would have made a difference. But he wasn't getting nominated, much less elected, anyway. Those now wanting a 3rd party, etc., need to bear those realities in mind. Realism is sine qua non, but what's the opposite of idealism? Cynicism? Corruption? JFK called himself "an idealist without illusions." Something like that would be nice. @ Carrie, I absolutely ditto what you said. 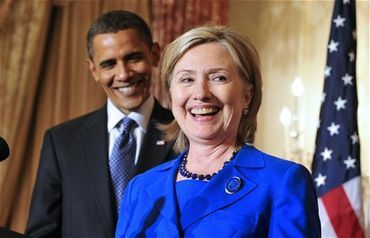 I keep posting that there is a petition out there to draft Hilary for POTUS in 2012. Have had no response to my statement. Would appreciate some opinions. I doubt seriously she would be in the least interested at this time, Dotti. She won't bite the hand that feeds her. Easy answer actually just based on her senate record. ABSOLUTLEY. She actually went to work. I've always thought they were the same person, politically. I think Hillary would've been more Forceful, but it doesn't matter. I'm sure she will run in 2016. The Democratic Party has been converted to Moderate Corporatists. just wanted to say tthat decisions which are taken in the past are exactly that - they belong to the past- speculation about the past is a no go. Every day which passes a new reality is formed and so on. So many things are happening and fast- who knows who the candidates will be in the next presidental election-the best candidate doesn't always win as we have seen from so many other other times and in so many other countries. anybody would have been better than obama. he didn't do anything in congress and he doesn't have a clue in the white house. i really hope somebody steps up and runs against him. he's not the best there is. no where near it. Sorry to disagee John but I do think that Hillary would have been a better President. As for Slick Willie, he probably would have been a pretty good First Lady except that the female White Staff might have been in some jeopardy. Does it matter who would had been president when you have right wing extemists in congress willing to bring the country down due to their ideological fanaticism? Even if a centrist Repug had won the presidency, they would be facing major challenges by their tea party base! You only have to look on how Boehner was treated, challenged when he first tried to pass his debt ceiling plan! Boehner couldn't even get enough votes to pass it, until he made changes to pacify those Repug baggers. Better? Different for sure. Would have thought she would be more divisive, but with a lack of leadership from Obama, I'm not certain that would have been the case. Anyway, she seems happy in her role now. So, no! The republicans would have torn Hillary into pieces just as they did when she tried to introduce health-care reform during the Clinton administration. Independent thinking Women, and minorities are outside of the republicans inner circle, which is made up of mostly, wealthy white males! Here we are in the 21st century and how many women presidents have we had? Yes, we finally have a minority president, and look at how he is being treated, reviled, insulted, and blamed for everything bad that happens! So, what makes us think that a woman will be treated any better? No, this is still a conservative white male dominated government, but big changes are on the way! In about 20 years it strongly begins. Then In 50 to 60 years, it will be over! The minorities, women, and liberals will rule the United States of America, forever! And they will overthrow the right-wing conservatives, and completely break their political power! I was watching a movie the other night called "The Buccaneers" which was set in the 1870's. In it this one Lady made a statement very akin to the following, "Old men make money, while young men die," evidently referring to profits made out of war. And to tell you the truth, nothing much has changed since then. That's pretty much the way it's been. Those who control the power, control the oil, arms, ammunition, and most of the nation's wealth. Will never allow a woman to rule, unless she is a puppet which is controlled by them! Why do you think that they are so desperate, and even reaching out to the extreme right-wing for their help? They have read the writing on the wall and understand that they only have a limited amount of time in which to plunder the country for themselves and their cronies. Then, the end will come, and women will finally achieve, complete equality with men and ascend to many of the highest offices of the country! John S. - "Would have thought she would be more divisive"
On the contrary, Obama has been quite "divisive". Woulda, coulda, shoulda or, in Americanese, being a Monday morning quarterback. Thought experiments like this can be fun but are ultimately worthless. What if the South had won the Civil War? What if Nazi Germany had won WWII? 20/20 hindsight always allows us to see how things might of been better but, we have to deal with the here and now reality of past decisions. Hypotheticals, they are like a US dollar nowadays, can't even buy a cup of coffee with them. I voted for Hillary she seems to have more back bone to hold office, but when Obama took over I also believe he could be good. Oh well...we all make mistakes.....I am talking about me.